If you have an Apple TV 1 (the silver one) and would like to install XBMC on it, then you need to follow the guide below. 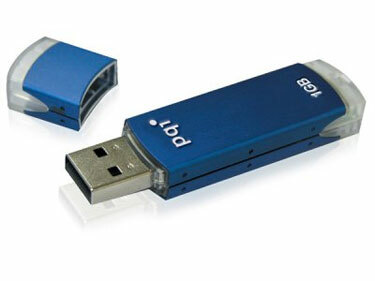 USB Thumb Drive (512 MB minimum) Formatted with FAT32. 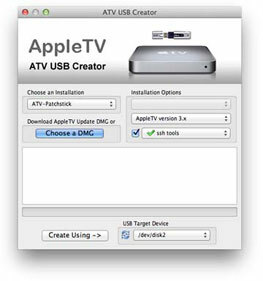 Step 1: Get the ATV USB Creator for Mac software onto your Mac computer. 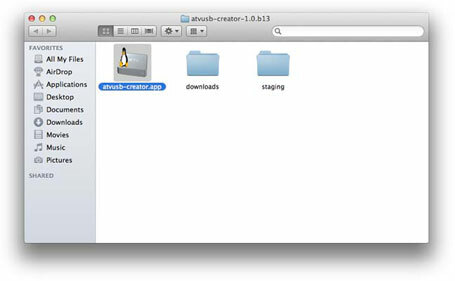 Extract the contents of the zip file and open the “atvusb-creator-1.0.b13″ folder. Step 2: Plug in a USB Thumb Drive (formated in fat32) into your Compute, or format it into fat32. 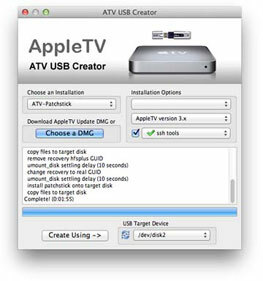 Step 3: Launch the atvusb-creator.app by double clicking the icon. Step 4: Leave everything as Default and press the "Create Using ->" Button. It will take a few minutes to create the Patchstick. When it’s finished the word “Complete!” should be on the last line of the log text box. Step 5: Unplug the power cable from the Apple TV device. Step 6: Plug the USB Thumb Drive into the back of your device and plug the power cable back in. Step 7: Wait a few minutes while the Patchstick processes the installation. Step 8: Unplug the power cable and Remove the USB Thumb Drive from the Apple TV. Step 9: Replug the power cable back into the Apple TV. Step 10: Now find the “Downloads” menu under the “Launcher” heading. Step 11: Click the “Launcher” program to update it. Step 12: Return to the “Downloads” menu under the “Launcher” heading. Step 13: Select the latest version of “XBMC” from the options. Thats it Your first generation Apple TV is now Jailbroken and XBMC has been installed.